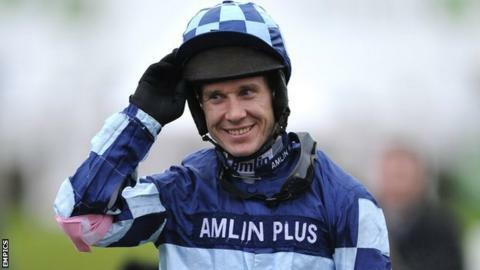 Richard Johnson notched the 3,000th winner of his career as he continued his march to the champion jockey title with a victory at Ludlow on Monday. The 38-year-old won the opening race at the Shropshire track on favourite St Saviour to reach his landmark. "I really must say that I'm only as good as the horses I ride and the trainers and owners I've been associated with," said Johnson. "I'd like to thank all the people I've ridden for over the past 22 years." Johnson's tally is made up of 2,977 jump wins in the United Kingdom, 17 in Ireland, four flat and two international victories. His 172nd winner of the season puts him 70 clear at the top of this year's standings as he looks to clinch the title dominated by 20-time champion AP McCoy prior to his retirement in April. Johnson, from Hereford, has ridden in 16,744 races and needs four to reach 3,000 jump wins - a feat only McCoy has managed.